Every year at the end of February a group of scientists travels to Eureka, Nunavut, 80°N. 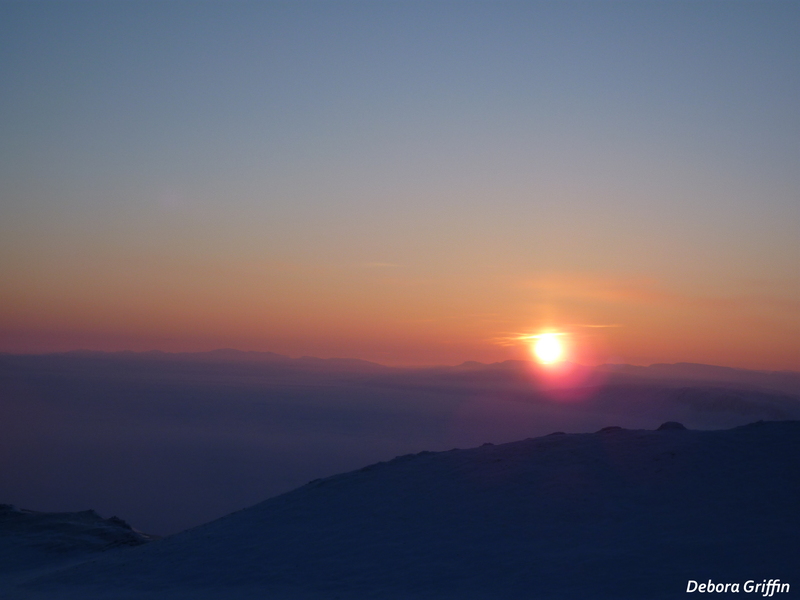 On February 21st, when the Canadian Arctic ACE/OSIRIS validation campaign typically starts, the sun rises in Eureka above the horizon for the first time since October 20th. Every day, daylight hours increase at a rate between 20 min and 1 h per day, until the sun no longer sets on April 13th. Up in Eureka, we perform measurements with ground-based instruments. Many of these instruments, which we are using for the validation campaign, use the solar spectrum to obtain information on specific gas concentrations in the atmosphere (mainly in the troposphere and stratosphere, i.e. roughly between 0-50 km from the Earth’s surface). The sunlight that travels through the Earth’s atmosphere is partially absorbed by different gases before it reaches our instruments’ detectors. Gases have characteristic absorption lines, which have different shapes and occur at different wavelengths (see Figure 1). This makes it possible to obtain information about the concentrations of different gases and distinguish between them. Figure 1: Solar spectrum recorded with the Portable Atmospheric Research Interferometric Spectrometer for the Infrared (PARIS-IR) on 1 March 2015. The zoom shows the O3 absorption lines. The elevation of the sun during spring is beneficial for solar spectral measurements, because the path of the sunlight to the detectors is very long; therefore absorption lines from atmospheric trace gases occur more strongly in the spectra. Spring is also the time when a stratospheric ozone hole can occur within the polar vortex. 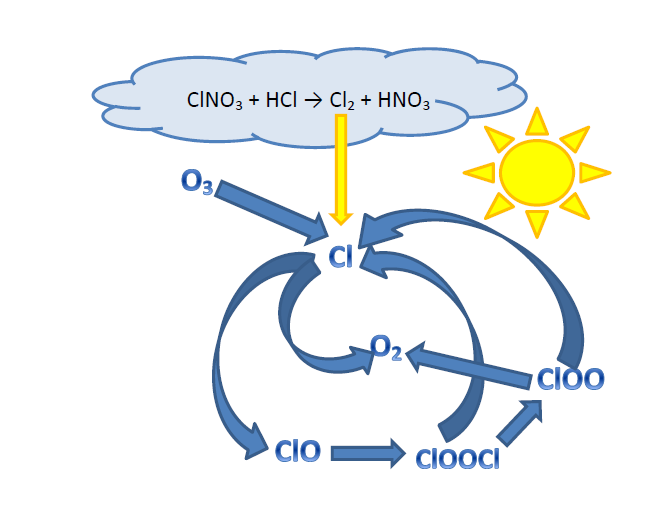 Figure 2: Illustration of the chemical reactions responsible for polar ozone depletion due to Polar Stratospheric Clouds (PSCs). The polar vortex is a cyclone (low pressure system), located in the upper troposphere and lower stratosphere over the polar regions. It has a very cold core which is strongest during winter and weakest during the summer months. Polar Stratospheric Clouds (PSC), which are the cause of polar ozone depletion, can form under very cold conditions (if the temperature is lower than -76°C) in the lower stratosphere around 20 km. These clouds make it possible for a chemical reaction (see Figure 2) to occur which results in diatomic halogens and nitric acid ( HNO3). In spring, when the sun rises, the bonds of the diatomic halogens break and form halogen radicals, which are responsible for the ozone depletion. Even a single halogen radical can destroy many ozone molecules, causing ozone depletion. Figure 3: Polar sunrise in Eureka. It is extremely important to take ground-based observations so far north to understand the atmospheric dynamics and chemistry within the polar vortex. The location of the polar vortex core varies quite a lot, but usually doesn’t reach latitudes much lower than the location of Eureka. Also, the very low water vapour content in the high Arctic atmosphere is beneficial for measuring solar spectra. This is because the absorption of sunlight due to water vapour is quite strong, which can render many absorption lines invisible. Finally, ozone depletion in the Arctic does impact the amount of ozone over southern Canada. The effect of low ozone can be seen in higher UV index reports. This entry was posted in ACE Arctic Validation Campaigns, Eureka field research, Eureka Pictures, Uncategorized and tagged Arctic, Arctic science, Atmosphere, Eureka, PEARL, PhD research. Bookmark the permalink. 1 Response to Why do scientists travel to Eureka during polar sunrise?